In this irresistibly imagined belowstairs answer to Pride and Prejudice,the servants take center stage. Sarah, the orphaned housemaid, spends her days scrubbing the laundry, polishing the floors, and emptying the chamber pots for the Bennet household. But there is just as much romance, heartbreak, and intrigue downstairs at Longbourn as there is upstairs. When a mysterious new footman arrives, the orderly realm of the servants’ hall threatens to be completely, perhaps irrevocably, upended. CHRISSI: Do you think it’s important to have some knowledge of Pride and Prejudice before reading this book? BETH: Hmmm, yes and no to this question! I think it helps knowing the bare bones of the story as to what is going on in the Bennet household at certain points but I think it also wouldn’t matter if you had never read P&P before. This novel can also work well as a stand-alone in my opinion, as it has plenty of plot without even bringing the Bennet sisters into consideration. BETH: As less of an Austen fan, was Longbourn what you expected? CHRISSI: It was better than I expected. I’ve made no secret of the fact that I’m not a fan of Austen. I was expecting to be bored by this book. Whilst it isn’t really my cup of tea, I found it enjoyable enough and I was expecting to give up on it. So it definitely exceeded my expectations. I actually found the first part of the book incredibly engaging and I was surprised. Unfortunately, I did begin to lose that initial enthusiasm, but it was still a good read for a non-Austen fan! CHRISSI: As a huge Austen fan, how did you find the reimagining of Pride and Prejudice from the servant point of view? BETH: It’s true, I am a huge Austen fan, and to be honest I was really worried that I wasn’t going to like this book- how could it every compare to the original? In all honesty though, what I really like about this story was that it didn’t rely too heavily on the merits of P&P and had an intriguing story of its own. It gives voices to those shadowy characters that we don’t hear too much about, and I think it’s a fresh twist on a much loved classic. BETH: What did you think about the relationship between Sarah and James and how it developed? CHRISSI: I thought Sarah and James’ relationship was intriguing. I thought James was an incredibly interesting, mysterious character. I wasn’t quite sure how to take him, or what his secrets were. However, I wasn’t overly convinced by their relationship. I don’t know why I didn’t really connect to them as a couple. I liked James as a character, but Sarah grated on me after a while. CHRISSI: Compare the choices that Sarah has in the novel, with those that Lizzie and Jane have to make. BETH: Sarah’s life is a world away from Elizabeth and Jane’s and it is interesting how she views it at times. For example, when she talks about the fact that if Elizabeth had to clean the mud off her own petticoats perhaps she wouldn’t tramp about in it too much! The life of a servant in Austen’s time was long and incredibly difficult, a large amount being very physically demanding which in comparison to the ladies is a huge difference – the heaviest thing they lift might perhaps be a needle for their embroidery?! On the other hand though, Elizabeth and Jane have a huge obligation to their family to marry well and perhaps not necessarily for love, which is a mammoth undertaking whereas Sarah is slightly more free to fall in love with whomever she wishes. BETH: Sarah has to choose between James and Ptolemy in the novel. Does she make the right choice? CHRISSI: Is it bad to comment that I don’t think she should have picked any of them?! I didn’t think any of them were particular amazing. I grew to like James more, but I won’t spoil it for anyone that hasn’t read Longbourn. If I’m thinking about it through the eyes of Sarah, then I think she made the right choice for her. CHRISSI: Discuss what the novel tells us about class, gender and race in the time of Austen. BETH: In the time of Austen, class was everything if you expected to make a decent marriage and women were not thought of as very useful creatures and were used by some men as mere ornaments to their good name. I did enjoy what Jo Baker brought to the table as regards race and being of a different colour which I think is rarely emphasised in many “white” classic novels. Sarah’s relationship with the black footman Ptolemy is regarded with some horror by Mrs Hill and he is rarely acknowledged as a person in his own right. BETH: I was slightly disappointed by the version of Elizabeth Bennet I read in this novel. Can you see why? CHRISSI: Yes. I don’t think Elizabeth Bennet in Longbourn was a very memorable character at all. I know I wasn’t the biggest fan of Pride and Prejudice, but I still remember her vividly. In Longbourn, she didn’t seem to stand out and wasn’t how I imagined her. CHRISSI: Did you have a favourite character? BETH: I actually developed a bit of a soft spot for both Mrs Hill and James, especially when we learn more about their history and back stories. I think the author took a bit of a risk with this (especially for die-hard P&P fans) but I think it really paid off. I actually loved the chapters where we learned more about James past and the trials that he has suffered. CHRISSI: I think I would give her writing another go. I thought the writing and prose was beautiful, I just wasn’t blown away by the story. I came across this survey from my sister’s blog and it looked like a lot of fun! You can see her answers HERE. No surprise here, Stephen King. For me, there is a reason why his surname is KING. This is an easy question for me, it would have to be Tatiana and Alexander by Paullina Simons. Her first book is The Bronze Horseman and to be honest, took my breath away. The sequel definitely complemented the first book! The Girl Who Fell From The Sky by Simon Mawer. Fitzwilliam Darcy – Pride and Prejudice. (SIGH) His attitude might actually have made me more interested!! A Study in Scarlet by Sir Arthur Conan Doyle. I really didn’t expect Sherlock Holmes to be this exciting! Mistress of Rome by Kate Quinn. Ancient Rome, gladiators, a bit of gore and romance. What’s not to like? LOVED this book. I have to say, it’s the same as my sisters. Starting this blog has been one of the best things I’ve done literally speaking (haha). I read from so many different genres that I wouldn’t have touched before, I’ve had some great recommendations, and met some really nice people! I’ve just finished Flight Behaviour by Barbara Kingsolver which was excellent. I’d like to think I read quite a wide selection of things, but I don’t really enjoy anything too fluffy or chick-litty. A bit of fluff is okay (I suppose) but not if it edges into mature cheddar cheese! The Lord of The Rings Trilogy by J.R.R. Tolkien at 1,216 pages, individually Gone With The Wind by Margaret Mitchell. The Unlikely Pilgrimage of Harold Fry by Rachel Joyce. I loved that book so much I just wanted it to go on and on. Uh-oh. This is where my book obsession borders into insanity. Two large ones in the sitting room jam packed to bursting. (I call it Book Corner). Two slim tall bookcases in the bedroom and er…. maybe one or two bookcases worth at my parents house? It – Stephen King. Amazing and terrifying and never fails to give me chills every time I read it. I have quite a long journey to work so I love to just escape into a book on the tube. Saves me having to make eye contact with any dodgy people as well, haha. A great motto for life as well I think! Spending so much time reading thrillers. Not that I hate thrillers, I love them! But at one time, they were all I read, I’m so glad I now read a mixture of different genres. I need to finish the Delirium series by Lauren Oliver. Pandemonium is coming up on my list pretty soon but I’ve just got so many books to read. Quite a few people (I promise I won’t mention King again…). I’ll say Philippa Gregory, I love almost all her novels and get very excited when one is due to be released. Dr Sleep – Stephen King. The follow up to The Shining. Oh damn, I mentioned him again. Being maybe a bit TOO control freakish with lending my precious books. Please don’t break their spine, I can’t take it!! This is based on my Kindle in alphabetical order as I’m not at home at the moment: Annexed by Sharon Dogar. The Cuckoo’s Calling by Robert Galbraith (spoiler alert) J K Rowling! Gone Girl by Gillian Flynn. Amazing! Please feel free to leave your link to your A-Z book survey and I’ll come take a look, I’d love to see some of your answers! Who was the real Jane Austen? Overturning the traditional portrait of the author as conventional and genteel, bestseller Paula Byrne’s landmark biography reveals the real woman behind the books. In this new biography, bestselling author Paula Byrne (author of Perdita, Mad World) explores the forces that shaped the interior life of Britain’s most beloved novelist: her father’s religious faith, her mother’s aristocratic pedigree, her eldest brother’s adoption, her other brothers’ naval and military experiences, her relatives in the East and West Indies, her cousin who lived through the trauma of the French Revolution, the family’s amateur theatricals, the female novelists she admired, her residence in Bath, her love of the seaside, her travels around England and her long struggle to become a published author. 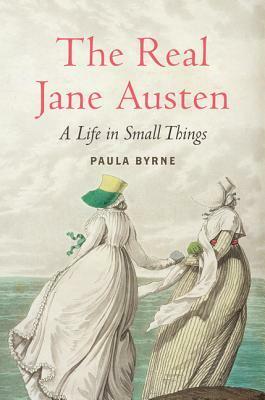 Byrne uses a highly innovative technique whereby each chapter begins from an object that conjures up a key moment or theme in Austen’s life and work—a silhouette, a vellum notebook, a topaz cross, a laptop writing box, a royalty cheque, a bathing machine, and many more. The woman who emerges in this biography is far tougher, more socially and politically aware, and altogether more modern than the conventional picture of ‘dear Aunt Jane’ would allow. Published to coincide with the bicentenary of Pride and Prejudice, this lively and scholarly biography brings Austen dazzlingly into the twenty-first century. I’m a big fan of Ms Austen, Pride and Prejudice and Sense and Sensibility being my favourites, so I was excited to read this new biography by Paula Byrne, having enjoyed her previous biography about Evelyn Waugh. It’s a great read, written to coincide with the 200th anniversary of Pride and Prejudice (please see my previous post HERE) and one I’d highly recommend for any “Janeites” out there. What makes it more interesting for me is how it is structured, instead of the factual dryness you can sometimes get with biographies, the author chooses to talk about Austen’s life through objects that belonged to her. The pictures of the objects, in particular the two topaz crosses that Austen’s brother chose to give to her and Cassandra (her sister), are beautiful and it added that little extra bit of charm to the book as a whole. The closeness of her relationship with her sister Cassandra was lovely to discover, and finding out about her extended family including her cousin Eliza (whom Mary Crawford in Mansfield Park is said to be based upon), was incredibly intriguing. There was certainly a host of exotic and surprising circumstances surrounding the Austen’s and their nearest and dearest. Finally, I think Paula Byrne did a fantastic job with this book, and I cannot wait to see what and whom she delves into next. Happy 200th Birthday Pride and Prejudice! One of my favourite books of all time, Pride and Prejudice, is 200 years old this year. And like any true classic, it still continues to delight its re-readers and bring in some new fans. There have been a couple of adaptations over the years, two that tend to dominate are the “icky Keira Knightly” version, (sorry Keira, its not personal I’m sure!) and the 1995 BBC version which is how I came to love the story to begin with. Yes, that was an admission, I’m afraid I did see it before reading the book. If you are a big fan like myself and haven’t seen it, I recommend tracking it down and watching it at once. However, it wouldn’t have changed anything, after going back and reading the book a number of times, I still rate it in the highest possible category. The question to ask I suppose is how and why is it still relevant today? In my opinion, the main character of Elizabeth Bennett – outspoken, independent and warm-hearted, gives women everywhere a decent female heroine that we can aspire to and believe in. And also (shock horror) she’s not perfect! She does have flaws and lapses of judgement like us all, a fact that makes her more adorable to the reader. The other characters in this novel are quite a mish-mash that work sublimely when combined with Austen’s dry wit and observations. Mrs Bennett – hilarious! Mr Collins – I actually can’t find the words to describe this “odious little man,” but believe he is beautifully cast in the BBC adaptation. And Mr Darcy- disagreeable, arrogant and hypocritical but somehow Austen manages to make him a romantic hero? The woman is a genius. So, many happy returns P&P….